Giani Iqbal Singh, Jathedar, Patna Sahib, today dubbed Sikh missionaries as “communists of the Sikh Panth”. Again challenging the supremacy of Akal Takht, Giani Iqbal Singh alleged that the English word “supreme,” used by Sikh missionaries for Akal Takht, was the root-cause of the current problem faced by the Panth. He said as a matter of fact no Sikh institute could claim itself being “supreme temporal authority” because Guru Granth Sahib is supreme for the Sikh community. Taking a strong view, Prof Suba Singh, principal, Sikh Missionary College, said Giani Iqbal Singh should consult some psychiatrist. He said the Sikh missionaries and missionary colleges had done great service to the Sikh Panth and Jathedar Iqbal Singh had no right to use derogatory words for them. However, the Jathedar, Patna Sahib, alleged that the Sikh missionaries had been instrumental in dividing the Sikh community due to their “radical approach”. He said as per the Sikh traditions, all five Takhts were equal. On the other hand, Prof Suba Singh said as per Sikh history, Akal Takht had been the target of Mughals and other invaders as they wanted to smash the supreme temporal authority of the Sikhs. No other Takht had faced such attacks, he said. He has also said edict once issued from Takht Patna Sahib, including rejection of Nanakshahi calendar, could not be withdrawn. He, however, added that the five Sikh high priests could discuss the matter relating to the Sikh maryada, Nanakshahi calendar in the forthcoming meeting at Akal Takht next week. To yet another question, the Jathedar said the meeting regarding summoning of Mohinder Singh Romana, president, Takht Patna Sahib Management Committee, was still pending because he (Romana) had sought adjournment of the meeting of Sikh clergy on health grounds. He said Romana in his capacity as president had no right to place Jathedar under suspension. Meanwhile, Giani Iqbal Singh said Pratibha Devisingh Patil, President of India, would be visiting Takht Patna Sahib to pay obeisance on February 16 . Giani Iqbal Singh today gave a “clean chit” to Diljit Singh Bedi, a former assistant secretary, SGPC. He said he had learnt that the “objectionable pictures” of Bedi, published in a section of the press, was with his second wife. He saidthere was no harm in keeping a “second wife” without giving divorce to the first wife. If he has 2 wives, he is a pattit. No doubt about it. This is just unacceptable, to be honest. wow..this is a part of the New EKTAMARYADA of the Panth ??? Will we have four wives like the Muslims or no need to count !! Notice the word "Keeping"..RAKHEL !!! Iqbal singh is not talking about marriage..just keeping mistresses...unlike the Muslim Law on Four Marriages.. There are anti sikh websites already created by muslims, who states that sikhs also have numerous wives. They have pictures of Iqbal singh with press statements about his two wives. This person is continously cauing unneccessary problems to ensure the Panth is not progressing and wasting its time. He is not worthy of any jathedari of any kind. Please help.....do i as an amritdhari wanna be have to accept hukams from the takats given by these jokers.....if so i would rather leave the faith because i would rather leave this dodgy sikhism of priests and clergy to the majority of the so called sikh world population of 25 million because this is what useless religion is all about.....please reply.....must i accept them as speakers of guru ji hence accept their hukams? 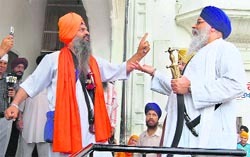 "Jathedar Iqbal Singh roughed up Takht Edict"
Quote "By passing this resolution, the Sikh clergy have imposed an undeclared ban on the entry of Giani Iqbal Singh in the meetings of Akal Takht." See the colors of KARTAAR. Whoever tried to supersede the supremacy of Sri Akaal Takhat Sahib receives this type of reward. Since the past several months he was thinking that he is a Don of Sikh world but see his condition now. If still he has a little bit moral left he should resign immediately and save the further damage to Sikhi and respect to the post of a Jathedar. Overall this is not good for the integrity of Panth. One should avoid those situations which makes TAMASHA ਤਮਾਸ਼ਾ of Sikh Panth. Wait a minute. What's wrong with giani Iqbal Singh keeping 2 wives? I think keeping two wives is punishment enough. No need to give the poor man some Tankhah as "punishment", that just pales in comparison. Very funny 'ootpathang' jeeo but what you have stated is 100% correct. The Singh keeping him out in orange dastar does stand out. I assume he is from the task force.